The core mission of The Allen Institute for Artificial Intelligence (AI2) is to achieve scientific breakthroughs by constructing AI systems with reasoning, learning and reading capabilities. AI2 is working to realize the vision of a "Digital Aristotle" - AI software that utilizes large amounts of knowledge in machine-understandable form to answer questions, explain those answers, and discuss those answers with users. Knowledge Acquision: Extracting knowledge from relevant natural language texts, supplemented by other sources and techniques such as crowd-sourcing and judicious use of manual encoding. Machine Reasoning: Performing inference with that knowledge to answer questions. Question Analysis: Use of natural language processing and other techniques to interpret the actual exam questions and connect them with the knowledge. This project is only in its preliminary stages, the first step of this endeavor is an analysis of a particular fourth grade test (the New York Regents Science Test) and its knowledge requirements, and an analysis of how well current automatic knowledge-base construction methods can meet those requirements. The system is currently existing as a partial prototype. 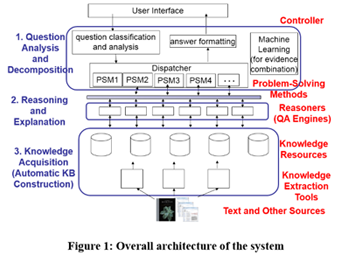 As shown in Figure 1, there are three main components in the system architecutre: question interpretation, reasoning, and a library of knowledge resources. Various technologies are being employed for different parts of the system, Allegro CL is being used for the question decomposition part of the question analysis phase, as well as for exploratory work for information extraction. For additional informaiton on the Aristo Project, see here.